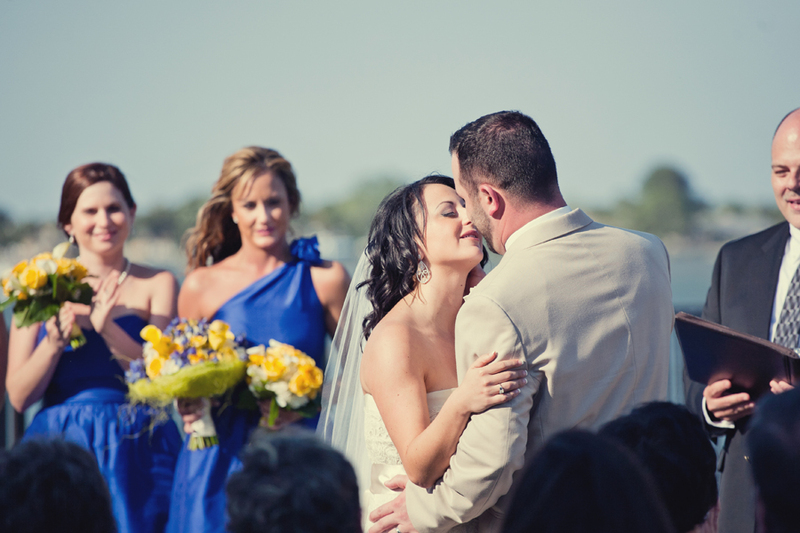 Heather and Josh had a beautiful wedding at the River House in St. Augustine. I started off the day with the girls at the Westcott House Bed and Breakfast while Andy hung out with the guys in the limo, beach, and pub. Their vibrant colors of royal blue and yellow went perfectly with the sunny spring day. Heather chose a beautiful Modern Trousseau gown from White Magnolia and a pair of blue Manolo Blahniks (a gift from her Aunt who shares her love of shoes.) After the reveal, we headed to the fort for some bridal party photos. The ceremony took place on the back lawn of the River House overlooking the water and provided a beautiful view of the St. Augustine Lighthouse. Lastly, the boys of D’Land Entertainment kept the party going with their fun antics. It was a great day! LOVE, LOVE, LOVE them all! You guys did a wonderful job capturing all the beauty of Josh and Heather’s day! Great pictures! Ohhh, I love the blue elements in these wedding shots. Beautiful.